One of the most popular posts on this blog is my “SketchUp Shortcuts Cheat Sheet”, a handy list of the shortcuts I use all the time. Those are all standard shortcuts that exist when you install SketchUp. A few years ago, I added a couple of custom shortcuts to help control the visibility of stuff in my models. This example is a room plan, but the situation occurs in almost every model: Something is in the way of the task at hand. You don’t want to get rid of the existing geometry, but it would nice to be able to see through the obstruction or make it invisible for a while. The X-ray face style turns all the faces in the model transparent so you can see through them. There are several ways to turn this feature on and off that do the job but take several steps. To save time, I created a custom keyboard shortcut that lets me toggle my x-ray vision on and off. Here is a screen shot of the model with X-ray turned on. I imported a floor plan as an image file and scaled it to its actual size. I modeled floors and walls by tracing over the imported plan. With X-ray on I can see through the floors to refer to the drawing and it makes it easier to move things around. I don’t like to leave X-ray on for very long. It is a compromise between being able to see through something and seeing so much geometry that things can get confusing. I tend to switch it on, perform one or two tasks and switch back to my normal style. Editing the style or working through the View menu interrupts the flow of work. In my mind this is the ideal scenario for a custom shortcut.When I find myself doing something tedious or repetitious in SketchUp I start looking for an alternative. In this case a custom shortcut allows me to toggle X-ray on and off. To create a shortcut, open the Preferences window. 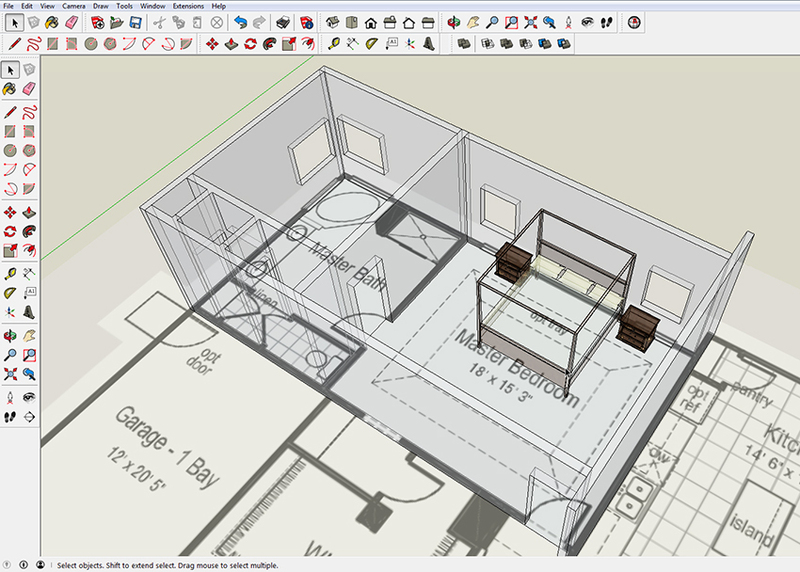 On a PC you’ll find it under the Window menu, on a Mac it’s under the SketchUp menu. There is a list of available panes on the left side of the Preferences window, look for Shortcuts and click on it. 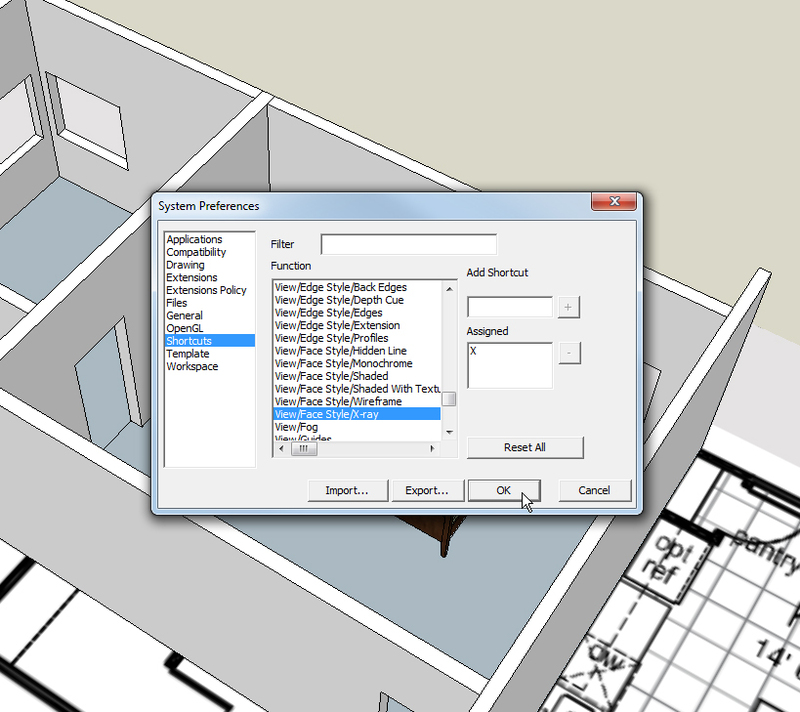 There you will find a list of the available commands in SketchUp. If a shortcut already exists, it will appear in the “Assigned” box. If that box is blank, type your shortcut it the “Add Shortcut” box then click on the plus (+) sign. Click OK and you’re ready to go. Sometimes it’s better to make something disappear completely rather than make it transparent. 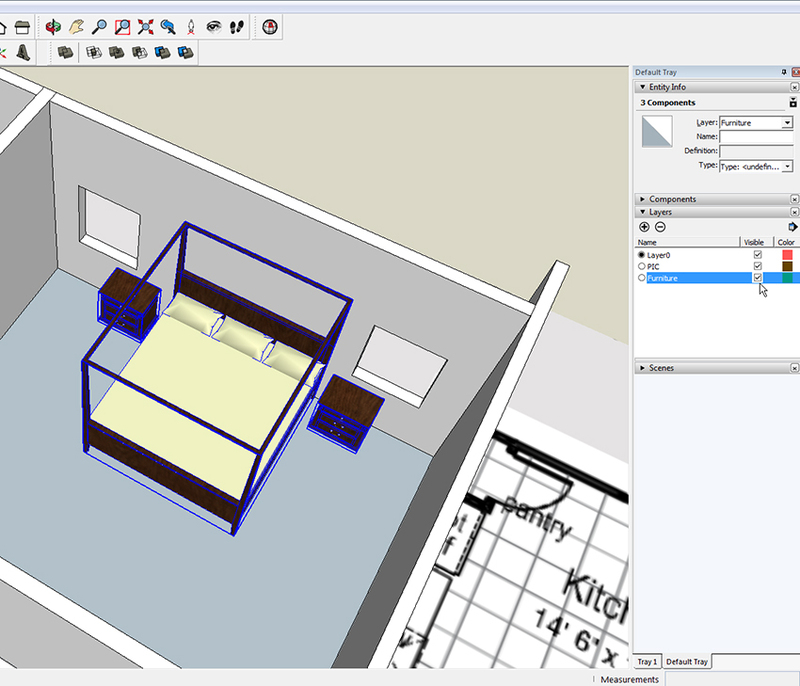 You can make objects invisible in SketchUp with the Hide command. 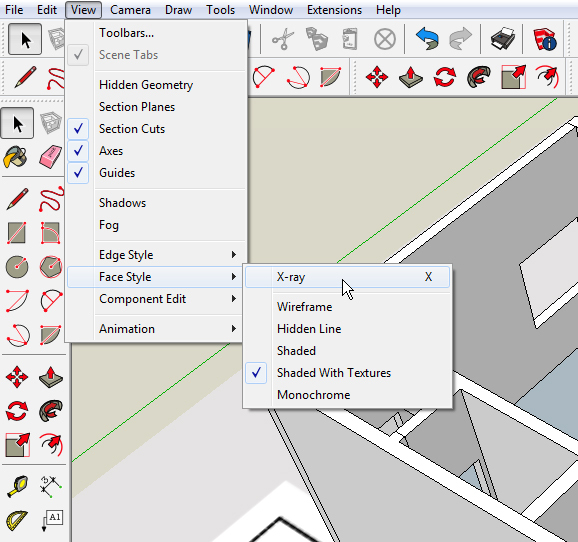 Just right-click over an object (or a selection of objects) and select “Hide” from the menu. The selected stuff still exists in the model, but you can’t see it. There are several ways to make hidden geometry visible again, but as it was with turning X-ray on and off, “unhiding” things can involve several steps. To make it quick and easy, I created another custom shortcut to quickly make invisible things visible again. The command I chose to duplicate is found in the “Edit” menu. You can see the steps involved in working through the menu in the screen shot at right. Go back to the Preferences window/Shortcuts and look for “Edit/Unhide/Last and assign it the letter “U”. Unhide Last makes the last thing hidden visible again. You might choose Edit/Unhide/All instead. That makes everything hidden in your model reappear. This works for me because I tend to hide something to get it out of the way so I can perform a specific task. As soon as that task is accomplished I tap the “U” key to unhide and move on to the next step. 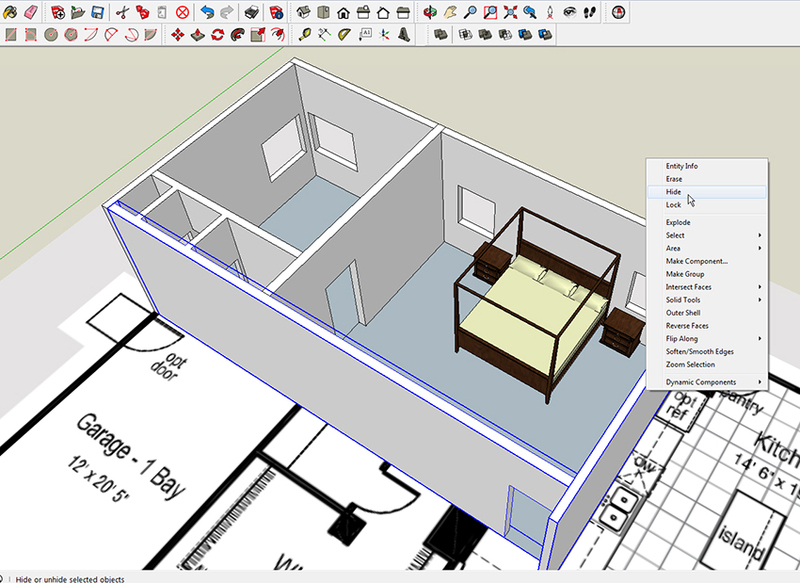 One of the best things about SketchUp is there are almost always several ways to get where you want to go. That also makes it a bit complicated when you’re learning SketchUp. To be a proficient modeler it pays to know how to use all the options. They more methods that you have in your bag of tricks, the more problems you are able to solve. You will also be able to do things in a way that makes sense to you. In the case of this model, it makes sense to park all of the furniture on a discrete layer. Just click on the plus (+) sign in the Layers window and give the new layer a sensible name. You can change the layer that an object (or several objects) are on by selecting, then choose a different layer from the drop-down list in the Entity Info window. Each layer has a “visibility” box in the Layers window so you can hide all of the furniture with one click in that box. 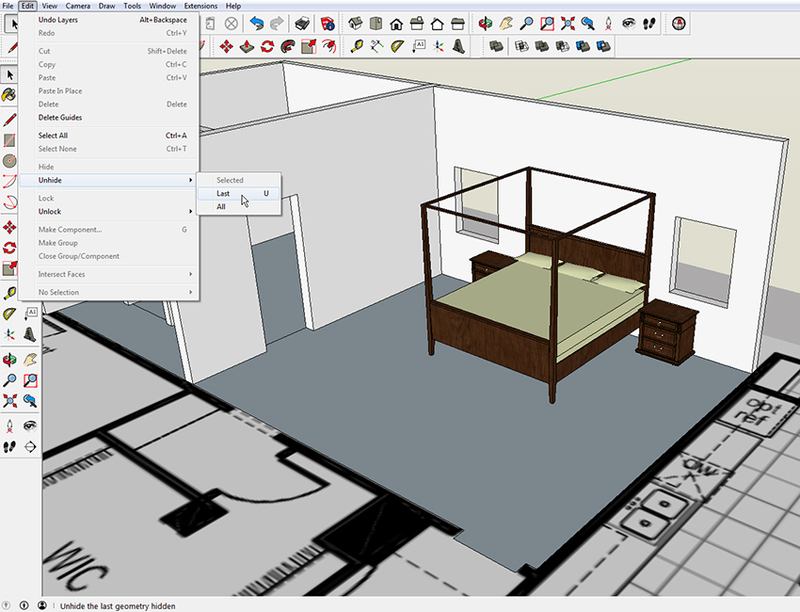 You can read more about using Layers (and Scenes) in this post “Organize a SketchUp Model With Scenes & Layers”. The video below shows how to set up custom shortcuts, and what they look like in use. This is great information, i have been trying to figure out how to finish up tasks quicker, and this will help.